Benefits to gardening go beyond healthy eating. Gardening is a good form of exercise. It gets your parent outside in the fresh air and sun. Gardeners work muscles when digging, raking, bending over to weed, and carrying a watering can. As mobility declines, it’s tempting to give up gardens. Here are four ways to make sure your mom or dad continues gardening as physical abilities change. 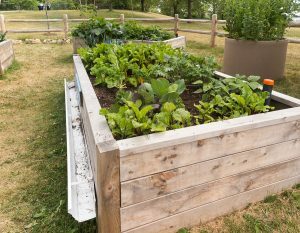 If your parent needs a wheelchair, raised beds along a patio are ideal. For a parent who needs a walker, put in gardening benches near a raised bed. Your parent can work from a seated position with a raised bed. If you have some woodworking skills, you can build these beds using cedar lumber. Cedar resists rot and keeps pests away. If you don’t, garden supply stores sell kits made from materials like wood or metal. You can also use cinder blocks to create the walls. You can then install them in the appropriate spot. Fill them with a mix of soil, manure, and peat moss. Add plants and the garden is finished. Knee Pads Attached to a Gardening Seat. Kneeling down on the hard ground hurts. If you have arthritis, it’s worse. With knee pads, there’s a cushion. Better is a seat that has attached knee pads. Your mom or dad can work from ground level without pain. When your mom or dad goes to stand up, they have a supportive handle. Arthritis makes it hard to hold and use smaller tools like pruners and trowels. When arthritis is present, your mom or dad needs tools with wide, comfortable handles. Brands like Radius and Garden Perfect make tools designed for people with joint pain. There’s a stand-up weeding tool known as Grandpa’s Weeder that’s sold online and in some stores. The device has a long handle like a shovel. Two prongs surround a weed and its roots. There’s a foot lever that causes the prongs to snap together. Pull the prongs out of the ground and remove the weed without needing to bend over. Make sure your parent is supervised while outside. In hot weather, it’s easy to dehydrate. You also don’t want your parent getting a sunburn or heat exhaustion. Caregivers make sure your parent drinks plenty of fluids and takes breaks. Senior care services go beyond safety reminders. Caregivers provide companionship. They help with household chores. Caregivers also help carry heavier items. If you or an aging loved one are considering senior care in Manalapan Township, NJ, please contact the caring staff at Lares Home Care 888-492-3538 or 732-566-1112.